Okay, Universal has officially opened up the "2014 Theme Park Wars" with an opening shot fired directly at Disney World. While Disney is getting ready to start construction on their big "Avatarland" project, Universal Studios Orlando is creeping closure to opening Diagon Alley. Which which be the newest extension of "The Wizarding World of Harry Potter" that will soon span both of Universal Orlando's Theme Parks. 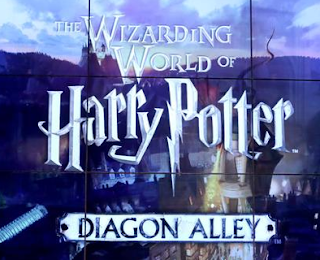 While most details of the new Diagon Alley project are unknown, we don't have to wait much longer. Universal has stated they will be unleashing the information very shortly, January 23rd 2014. However, we do know that Gringott's Bank Ride is coming as well as the Leaky Caldron Restaurant. Universal Orlando has also leaked details about the "Guest Stars" who will be present at the "Celebration of Harry Potter" which happens the very next day after the big "Diagon Alley" announcement. The park announced actors James Phelps and Oliver Phelps who played Fred and George Weasley and actress Evanna Lynch who played Lovegood in the eight Harry Potter films will be at the special event that will also bring in other notable people from the Potter universe on Jan. 24-26. The event will also feature an appearance by Kazu Kibuishi, an artist who re-imagined the Harry Potter book covers and Eduardo Lima and Miraphora Mina of MinaLima, graphic artists who worked on the films. It looks like the End of January will be very exciting at Universal Orlando. Never Fear, InSanity lurks Inside will post up details and rumors as they come our way. We'll also make sure to get the breaking news of Diagon Alley up as soon as we get our hands on them!